Open houses bring in potential buyers who may be unmotivated to book a showing. Buyers find open houses a convenient way to maximize their busy schedules. Your friends and family can mention the event to everyone they know who might be interested in taking a look at your home. Neighbors could be a valuable resource for referring potential buyers to your home – they might have friends and family who are looking to move. Add in advertising and signage, and you’re going to catch the eye of both casual and serious prospective buyers. When potential home buyers stop by your home for a traditional showing, they often do it with little notice, which is why it can be stressful keeping your home “show ready” for the entire duration it is on the market. With an open house, you’ll be able to prepare for an event that has the potential to bring in many prospective buyers with one fell swoop. There’s likely a limit to the number of times even the most interested buyer is willing to ask for a private showing. If your house has already caught the eye of a potential buyer, he or she might be more willing to come back for a second look in a less formal setting. An open house gives that buyer the opportunity to bring friends or family along for their opinions; and as a bonus, walking through an open house provides a visitor with plenty of time to look around without feeling rushed. Any given weekend usually sees several open houses in a particular location. Buyers interested in purchasing a home in your area will “comparison shop” by attending several open houses; this is your opportunity to make your home stand out from the crowd – make sure it looks fresh and clean. Some weekends see more open houses than others. Holding an open house has the potential to put your home on the real estate map. 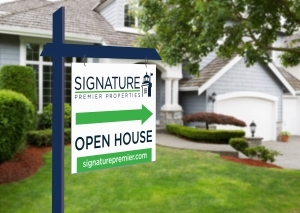 By working strategically with your Signature Premier Properties agent, they will have the knowledge to schedule a successful open house to get the maximum amount of traffic through your home.